It’s been a really strong week! I’m optimistically looking forward to my Monday weigh in. Here’s hoping I’m down about 2-3 lbs! I’ve been behaving, that’s for sure! And, even worked out twice at the hotel during my travel this week! Woooo! AND…. 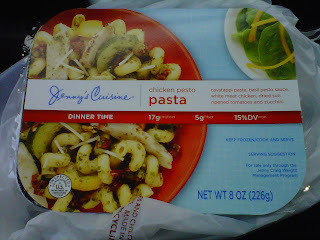 I have a new favorite Jenny Craig food. Yep, I’m over the Orange Chicken, and now I’m all about…. the CHICKEN PESTO PASTA! Holy basil and garlicky heaven!!! I’m so excited about this one! I am NOT a fan of squash… any kind of squash, and there’s two kinds featured in this pesto. The great news is that they are large enough to pick them out. Sa-weet! Remove them, if you’re like me and you’ll still LOOOOOVE the pesto! Here’s to an awesome weigh in next week!! !